SIIM's encourages the submission of ideas for software, apps, hardware, or other informatics technologies that solve a unique challenge in imaging informatics. 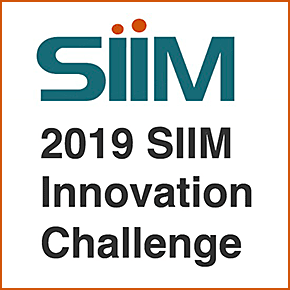 The 2019 SIIM Innovation Challenge winner will receive $10,000 to dive deeper into product development, and gain access to valuable resources through SIIM, including knowledgeable members of the business and academic sectors, to help bring this idea to fruition. The intended audience for the SIIM Innovation Challenge is the creative individual interfacing with the healthcare community from all angles of the organizational spectrum. Therefore, individuals, healthcare institutions, and corporations that serve the enterprise imaging informatics community are eligible to apply. Participation in the competition means that you agree to have your presentation evaluated publicly. In addition, you allow SIIM to use your name, likeness, and the information provided in the Innovation Challenge pitch to promote your product and competition, in print and online.